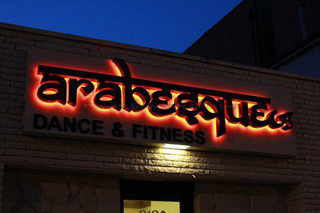 Arabesque is located at 3120 W. Belmont Avenue, on Chicago's north side. Just 2 blocks from the Belmont Blue-Line stop & directly at the Kennedy (90/94) Easy Free Street Parking on Belmont, Irene, Troy & Albany. O'Hare Blue Line: Using the Belmont Station, Walk East (right) on Belmont towards underpass. Cross street on Troy. OR Using the Logan Square Station, Walk North (left) on Kedzie towards Belmont underpass. Cross street on Troy. #82 Kimball Bus: Get off at Belmont Ave. Walk East on Belmont towards Kedzie underpass. Cross street on Troy. 90/94 East: Exit at Kimball and turn right, then immediately Left on Belmont. 2 blocks east to Kedzie, on the lefthand side. Closed Enrollment classes, AKA "Registering for the Session" is available anytime through the first week of the session. You place will be held for the particular class(es) on the day & time you've requested throughout that session. All classes may be registered for the best deal. If the school must cancel 1 class during the session (perhaps due to a severe snow storm) you will recieve 1 free class voucher. If you miss a class, you've missed that class, which can be made-up within the current session only. AKA "Open Enrollment" - The purpose of the punch card is to give you in-hand receipt of classes entitled to you in a pre-pay situation in addition to giving you a running tally of your classes remaining. Due to the nature of the business, Arabesque cannot re-issue or refund a punch card once it is bought as punch cards do not expire; punch cards are non transferable. Arabesque punch cards will occasionally be used for discounted entry into some events, as proof of studentship. When purchasing a punch card as a gift, the recipient's name must be given. Forgot your Punch Card? Studio policy is that you pay for your single class ($21) & we issue you a special reciept that you may bring back with your punch card next class, & we can issue that class on the punch card & refund your $21. No Exception. Cards are to be punched BEFORE you step into the class. Punch cards can be purchased anytime in person at Arabesque with Cash, Credit Card, Money Order or buy your punchcard(s) safely & securely on-line via the Arabesque Online Store. PLEASE Bring PayPal reciept with you to Arabesque when picking up your card, or request to have them mailed to you for $1. Money Orders can be mailed to the P.O. Box preferably than to the studio location. DO NOT MAIL CASH, and NO checks please. All Sales are Final, No Refunds Given. 1-day 'Class Sampler' events: Try a class! Bring a friend! All of the classes offered during the upcoming session are offered as a one-time drop-in format, although you are welcomed to try them all. Each instructor will offer class content that can stand-alone, as a sampling of the different skill lelvels & teaching styles available at Arabesque. Use this time to try the smorgasbord of offerings from whoever tickles your fancy, enabling you to better choose the one(s) you'd like to dedicate a full session to. 7-week Registered session: To give a full synopsis of learning, a full 'dedicated' session can offer work with technique/skill, or special props, a full choreography or combinations that may grow from one week to the next. Content *always* varies from session-to-session so you can walk away with something new even with years of experience. Regular class attendance is recommended, although drop-in students are welcome for certain classes. Note: There is a 5 student minimum on all classes, 30 max. Be Comfy! No jeans, mini skirts, or street clothes; also no baggy T-shirts, long skirts or sweat suits for students in the Fundamental level, green & blue star (we need to see knee position). For Belly Dance: Exercize/Yoga pants, or leggings with a fitted T-shirt, a tank top or sports bra that can show lower back position; bare feet, socks or dance shoes. NO STREET SHOES. Also, any scarf or shawl to tie low around your hips is very useful to see your hip movements in the mirror. For Hip Scarfs, Shawls, Jewelry, Unique Costuming & Exotic Accoutrements from the Orient and beyond we offer these for sale in our Boutique, or visit our twice annual Secondhand Souk Costume Swaps!